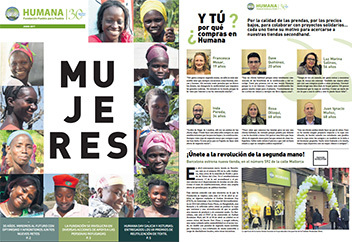 Download the latest edition of Humana News, which includes, among others, an article about the role of women in development and its importance for the progress of communities. You already have a new edition of Humana News with reports on environment, development cooperation and local support. Remember that you can consult it online, download it in pdf or pick a copy in any of our secondhand stores. 30 years, dozens of challenges overcome. Our house is your home, with information about the refugee support campaign in which the Foundation has collaborated. Spanish foundations involve 35 million people, according to a recent report from the Spanish Association of Foundations (AEF). The organization's traveling exhibitions continue to travel throughout Spain. The Spanish, more and more 'green' or how environmental awareness among citizens grows. The positive impact of the sale of used clothing in countries like Mozambique. New stage of the 3C project Cultivating Climate and Community. And you, why do you buy at Humana? : Testimonials from customers about the reasons that lead them to acquire secondhand gifts.